Nationwide Pet Insurance, formally known as VPI, is the first pet insurance in America, In fact, VPI was the first pet insurance to issue its first policy to a known celebrity named Lassie. In 2008, VPI joined Nationwide’s family. In 2015, VPI rebranded as Nationwide as one company, one brand. In 2016, Nationwide introduced the most comprehensive medical plan for dogs and cats covering both unlimited wellness and major medical coverage, called Nationwide Whole Pet. Only pet insurance in America that insures birds and exotics. First insurance company to offer a group discount, available through participating companies and organizations. 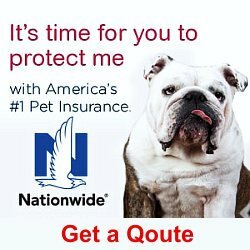 Nationwide has membership with Metlife, which allows Nationwide to offer pet insurance as an option to its policy holders. Major Medical Plan explained Major Medical Plan covers both accidents and illnesses but excludes coverage for congenital conditions. Will cover hereditary conditions, but with a 12-month waiting period. Set at 90% coverage, $250 deductible. Pays on a benefit schedule. Offers Whole Pet plan – Offers 90 percent coverage of actual vet bills with unlimited payout limits for wellness and major medical, $100 deductible. Coverage for Whole Pet Plan is for pets(dogs only) age 1 and over. Pets age 1 and under limited to Major Medical Plan. Major Medical Plan does not cover congenital conditions, and coverage for hereditary conditions is a 12 month wait. No 24/7 customer service. Closed Sundays. A monthly fee of $2.00 will be assessed for enrollees choosing monthly vs annual coverage. 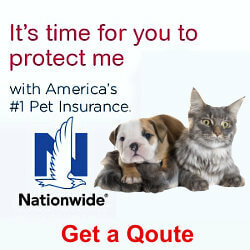 Nationwide offers two accident and illness plans, the Whole Pet Plan or the Major Medical Plan. Although less expensive, we do not recommend the Major Medical plan because this plan excludes congenital coverage, and hereditary conditions require a 12 month wait. However, we do recommend The Whole Pet Plan, which is the most comprehensive plan among all the insurance plans available today, covering nose to tail coverage, with unlimited payout for both wellness and major medical, set at 90% percent payout and $100 deductible. Furthermore, the Whole Pet Plan covers both congenital and hereditary conditions with only a 14 day wait. However, the Whole Pet Plan has an age qualification requirement – the dog has to be age 1 and over to qualify. (Cats any age) Therefore, as long as your dog is one year or older, Nationwide Whole Pet Plan offers the most complete insurance plan, and highly worth considering. Click on Get a Quote from banner link above,and see if Nationwide Whole Pet Plan would be the right fit for your pet.